Since Matt Cutts left, John Mueller has been taking the brunt of the Google search complaints from the webmaster and SEO community. Truth is, the harassment he is getting is disgusting and I find it absolutely embarrassing coming from this site and from the SEO community at large. John has class, he keeps doing what he does, which is really trying to help webmasters, despite what people may think. John knows it is a small but vocal group of webmasters and not the industry at the whole. But honestly, he does not deserve the hate - he really is an asset for you and the industry. Recently, YouTube captured John looking up, in a video he did this week where I covered him talking about reconsideration requests and a search update and some webmasters had to comment. They take low immature shots at John because they dislike Google and he is the face of Google's search now. 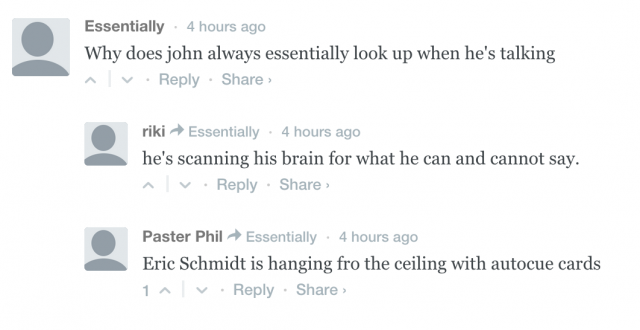 Just to be clear, the image above is not an example of the nasty things people say to or about John, this is an example of a fun set of comments, showing how John embraced it with humor. John responded to that saying "Drats, my secret is out." I try to delete the completely offensive and off topic nasty comments but yes, some slip through. I know some of you here hate Google, and thus want to take it out on John. But he is a good person, with a family and a life and he is doing his job. I have been threatened, harassed, and worse - so please give him some space - it simply is not nice. He seems immune to it now but still. Trust me, a Google without John is a bad thing for you.